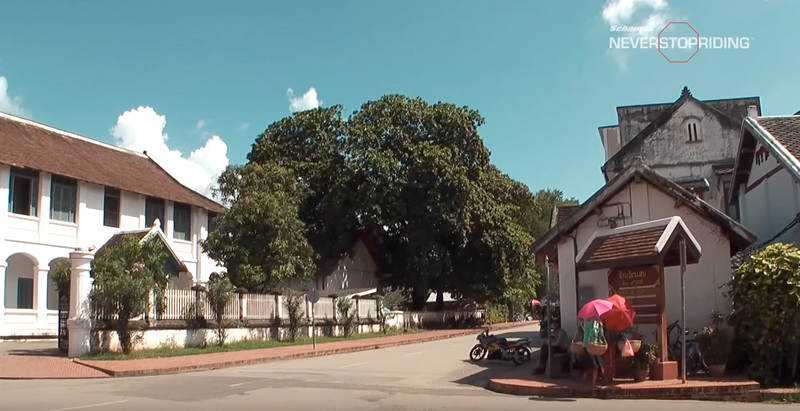 In this episode of Schampa Never Stop Riding in Laos, we will follow Andy Myers around Luang Prabang and its surroundings. Walking just after the sunrise Andy Myers is pleased to see a Buddhist tradition, where all the monks from all the temples from the city are walking in line in the streets receiving food donations from the locals. Another interesting thing in this episode is to see how they make the bamboo walls for the huts, made by hand. After the walk, Andy Myers take the bike and the road towards the Kuang Si Waterfalls National Park on a great scenic ride, crossing with an elephant on the road and find a small dirt trail to have some fun. At the Kuang Si Waterfalls National Park, there they have a small zoo with bears. It is rainy season in Laos, so the waterfalls from the national park are overflowing with so much water, making it impossible to swim and even go close to the falls. Them it is ride back to Luang Prabang with the beautiful landscape Laos as scenery and an amazing sunset.